DONNA — A trio of third-grade girls shaped dirt into a heart around the Pigeonberry they planted Tuesday morning at J.W. Caceres Elementary School. 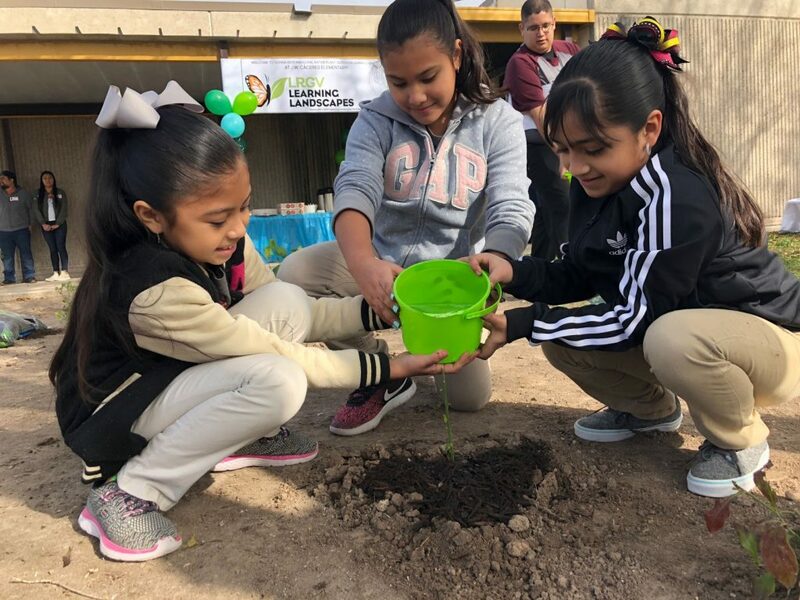 Members of the Lower Rio Grande Valley Learning Landscape Collaborative — composed of several organizations including support from Texan by Nature — launched a garden at the campus as part of a continuing effort across the Valley to grow native habitats outside classroom doors. PSJA ISD began the pilot program in 2017 before it expanded to school districts in Harlingen, McAllen, IDEA Public Schools and now Donna. “As the Valley continues to grow at a rapid rate, we need our children to understand the ecological importance of our soils, of our plants and how to have economic development coincide with ecological health,” said Allen Williams, habitat specialist with PSJA ISD, who spoke to students in Donna. Camila Gamboa and Kaitlyn Lazo, both 9, read their essays about the benefits of having the garden at their elementary school. The two third-graders were recognized Tuesday for their winning essays. “It will be important because it will help us find out how native plants smell,” Lazo said of the garden. Their classmate, Susan Salazar, 9, helped in the design aspect. Salazar’s vision will become a reality with the school expected to further develop the initial phase of the garden. In November, Laura Bush visited an elementary school within PSJA ISD and recognized the district’s preservation efforts for launching the collaborative in the Valley. The outdoor classroom also serves as a conservation project that aims to educate students on the importance of cultural pride and respect of the Valley’s ecosystem. Third-graders planted Turk’s camp, Plumbago, Red Sage, Scarlet Sage, Resin Bush and Padre Island Mistflower. “We know the Valley is such a geographically diverse area that when you plant the native plants, the butterflies come,” Williams said. Third-graders will begin curriculum in February encompassing not only science but also writing, reading and art — along with life lessons. Science teacher Nancy Montelongo at Caceres Elementary said part of the Friday school day will be designated for lessons in the garden.